I spent the weekend at Oulton Park for the opening two rounds of MSV’s F3 Cup Championship. Friday was overcast but dry, but the racing on Monday was wet. 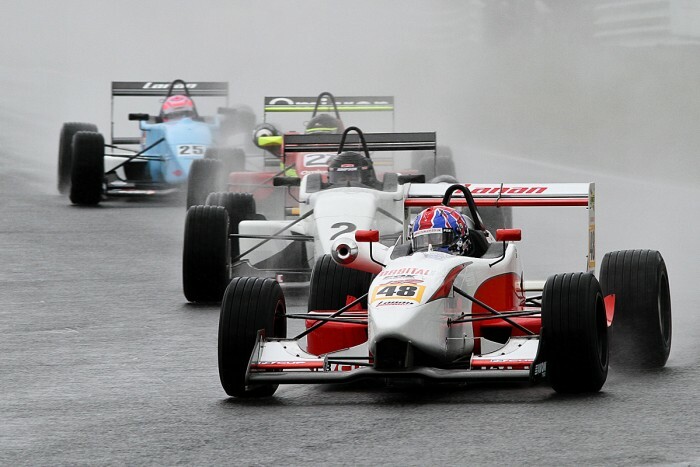 Racing cars look great in the rain, but the problem compounded by open wheel cars, is that the leader has a clear view ahead, but there is so much spray flung into the air by the tyres and the aerodynamic devices on the car that getting clear pictures of cars following can be almost impossible. Local man and professional driver Jamie Stanley won both races, with a terrific scrap between Mark Harrison and Tristan Cliffe behind, although in race two the two touched, dropping Harrison down to fourth and Cliffe out of the race. Chris Needham and Louis Hamilton-Smith took the remaining podium places in that race.